After 20 races over eight grueling months, Formula One heads to Abu Dhabi for the concluding grand prix of the season. Here, we take a look at five key talking points ahead of Sunday’s race at Yas Marina Circuit. 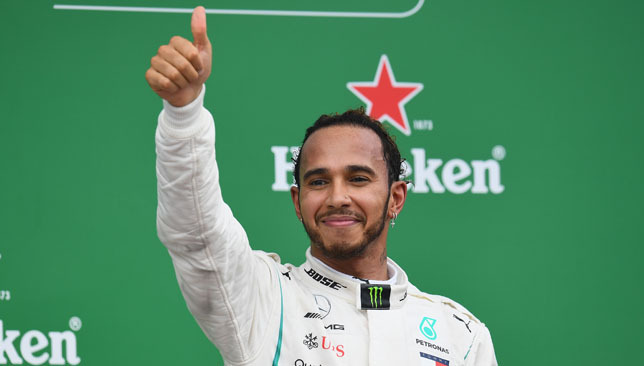 Lewis Hamilton was given a champion’s welcome when he returned to the Mercedes factory for the first time since sealing his record fifth championship at the Mexican Grand Prix. The 33-year-old was greeted with a guard of honour by the 900-strong staff at the Mercedes’ headquarters in Northamptonshire following the team’s fifth successive constructors’ championship victory in Brazil. 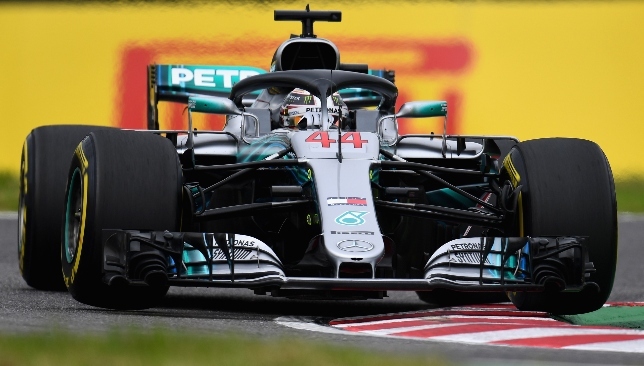 The team’s latest success means they are now level with Ferrari on five consecutive wins with no team having ever lifted six titles. The Briton will bid to see out the championship with his 11th win of the season in Abu Dhabi, a track where he has tasted victory on three occasions. With both the drivers and constructors championships settled, there is only pride to play for Sebastian Vettel at Yas Marina Circuit on Sunday. Vettel, who led this year’s championship until round eleven in Germany, will be hoping to finish his season on a positive note in the UAE capital. 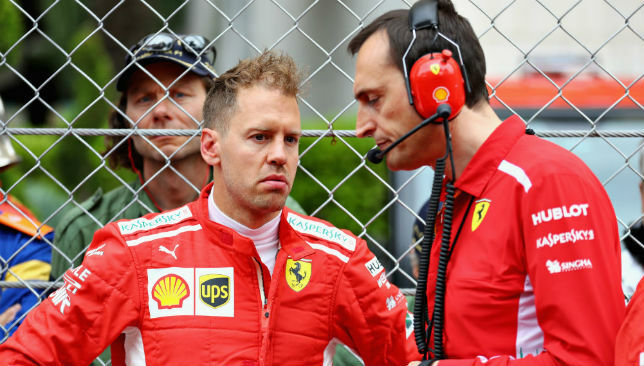 Following his sixth place finish at the most recent Brazilian Grand Prix, Vettel has struggled in the second half of the season, while Hamilton has excelled. The 31-year-old is a three-time winner at Yas Marina but has not won at the track since joining Ferrari in 2014. Could this be the year he rediscovers some of that old magic? Double world champion Fernando Alonso will bring the curtain down on his storied F1 career in Abu Dhabi this weekend. The 37-year-old is nearing the end of his 17th season in the sport and will race in the Indy 500 next year as he attempts to secure the ‘Triple Crown of Motorsport’. The Spaniard, a double Monaco Grand Prix winner in 2006 and 2007, won the Le Mans 24 Hours with Toyota in June this year and is tenth in the drivers’ championship standings. His glittering career has included 32 wins, 22 pole positions, 97 podiums and world championship triumphs in 2005 and 2006, although he has not finished on the podium since joining McLaren in 2015. With nine top-10s this campaign, Alonso will be bidding to bow out with a formidable finish. 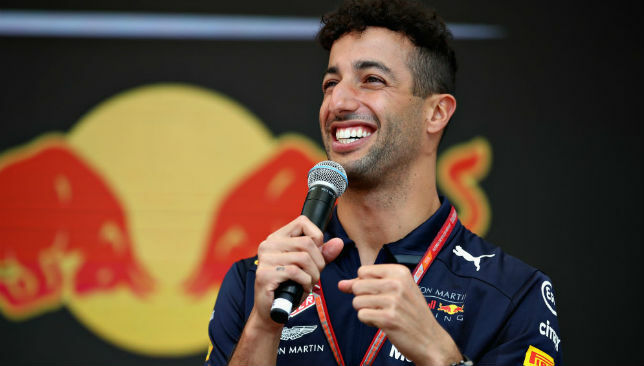 Daniel Ricciardo has emerged as one of the sport’s most likeable figures – but he has looked low on confidence since winning the Monaco Grand Prix way back in May. At that point of the season, Mercedes and Ferrari were circling for his signature, but he ended up signing a long-term deal with Renault – a team who have not secured a podium since the Malaysian Grand Prix in 2011. There is no guarantee the Australian will slot straight into the Renault and challenge the big three, especially with his teammate Nico Hulkenberg producing some solid performances this season and unable to threaten a top four finish. Without a podium since May, adding to his eight retirements, this could potentially be the last chance for 29-year-old Ricciardo to walk on top of the steps and celebrate a top three finish. Formula One’s season-ending fixture has come under criticism in recent years for its lack of action and failure to deliver an exciting race. Despite a spectacular setting at Yas Marina, drivers have felt the track isn’t challenging enough to be the final race on the calendar. Hamilton called for changes to be made to the 3.4-mile circuit last year while Kimi Raikkonen and Max Verstappen labelled it ‘boring’. The Yas Marina circuit joined the F1 calendar in 2009 and has acted as the season finale venue for every season expect 2011, 2012 and 2013. Valtteri Bottas became the fifth different winner of the race by converting his pole position into victory last season, while Hamilton and Vettel share three wins each. McLaren will have a special one-off livery on Fernando Alonso‘s car at this weekend’s Abu Dhabi GP as part of their farewell. 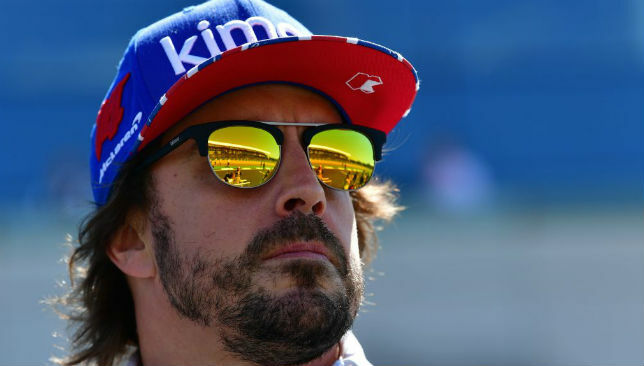 Two-time world champion Alonso is leaving Formula 1 after the season finale and has said he does not plan to return. To mark the occasion, McLaren have unveiled a new livery on Alonso’s MCL33, which includes colours of the Spaniard’s helmet – blue, yellow and red – in the orange and black livery. The colours have been emblazoned across the car’s engine cover, while there is also a special ‘FA’ logo on the top and sides of the cockpit. “We want his last grand prix to feel special in every way, and this was just one of the ways we could reflect that,” said McLaren CEO Zak Brown. 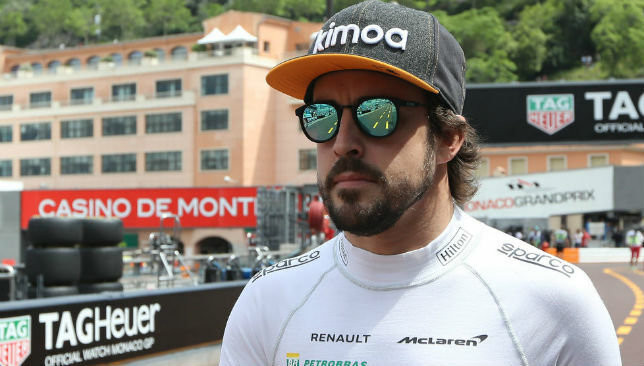 “We worked closely and collaboratively with Fernando, and then with the FIA and Formula One to make the change for this one race, and they were all hugely supportive of the move. It will be the first time McLaren enter a race with a one-off livery since bringing a yellow-branded car for Keke Rosberg at the 1986 Portuguese GP. Alonso who joined McLaren in 2015, will remain with the team but no longer as an F1 driver. Instead, he will lead McLaren’s bid to win next year’s Indianapolis 500 as he goes for motorsport’s unofficial ‘Triple Crown’ of winning the Indy 500, the Monaco Grand Prix, and the Le Mans 24-hour race. But with his F1 career set to come to an otherwise underwhelming end – the Spaniard, widely regarded as one of the best drivers of his era, has not won a race since 2013, when he was with Ferrari, as McLaren have struggled to give him a competitive car, and a low points finish is all he can reasonably expect in Abu Dhabi – this weekend’s one-off livery will at least be a memorable way to send him off. 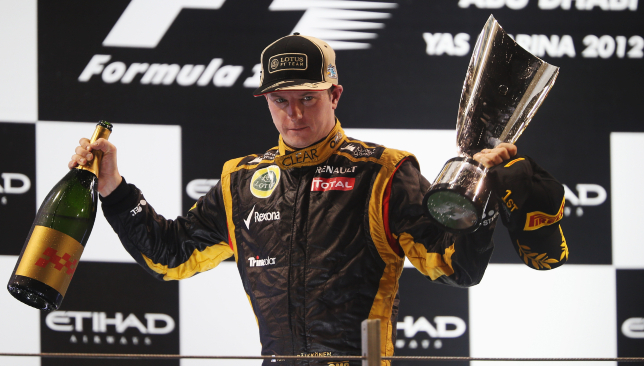 Raikkonen notched up his maiden win since his two-year sabbatical. If Greta Garbo were to drive a Grand Prix car, would she choose a Lotus? It was not the movie star who drove the Lotus to victory at Yas Marina Circuit in 2012, but a man who also spurned outside interference. ‘Leave me alone, I know what I’m doing,’ Kimi Räikkönen told his pit crew as they tried to keep the Finn abreast of developments in an incident-strewn fourth Abu Dhabi race which he was leading at the time. Both car and driver were proof of a resurrection of sorts. The 33-year-old, world champion with Ferrari back in 2007, was back in F1 after a two-year sabbatical in which he had focused on rallying rather than circuit racing. The so-called Lotus, meanwhile, was not so much a reborn version of one of Grand Prix racing’s most iconic marques, but a briefly rebadged Renault team trying to work its way back to the glory days of 2005 and 2006 when it won both world titles with Fernando Alonso. Kimi qualified only fourth in a session that produced the first surprise of the Yas Marina weekend. In year four, for the first time, a driver other than Lewis Hamilton or Sebastian Vettel found himself on the front row, in the form of Red Bull’s Mark Webber. While teammate Vettel was relegated to the rear of the grid because of a fuel infringement, the Australian lined up alongside that man Hamilton, whose best lap of 1:41.497 put him on pole in the UAE for the second time, in his final appearance there for McLaren before switching to Mercedes in 2013. While Webber dwelt on the line and was swamped by the pack, Hamilton sprinted into a lead he never looked likely to relinquish – until outside circumstances intervened. Early in the race his future teammate Nico Rosberg was eliminated in a Turn 16 collision with Narain Karthikeyan’s HRT that was spectacular but eventually harmless – except to both cars, which were out on the spot. The resultant Safety Car period lasted until lap 14, and four laps later the leader too was gone, victim of a sudden and terminal loss of fuel pressure. That left the reborn Räikkönen in the lead, a position he occupied with considerably more calm than the crew on his pit wall. And Kimi did indeed know what he was doing: despite a late charge by Alonso’s Ferrari, the Flying Finn held station till the end to claim his first victory since Spa-Francorchamps in 2009. This Abu Dhabi victory was Räikkönen’s 19th in a Formula 1 career that had started back in 2001 with Sauber. Ironically, as the 10th Abu Dhabi race approaches, Kimi is on the cusp of another return: to his old team Sauber, now powered by Ferrari, as he prepares to change places with that team’s young phenomenon Charles Leclerc in 2019. Räikkönen’s heart-warming win had little bearing on the outcome of the 2012 Drivers’ Championship in which Vettel and Alonso were the only remaining competitors. The German came to Abu Dhabi 13 points ahead and left with a still-comfortable margin of 10 after an outstanding drive from pit lane to podium. While the 2012 season had been remarkable for producing seven different winners in its first seven races, Vettel eventually won five in all to claim a third successive world title ahead of Alonso and… Räikkönen. Kimi’s exasperated comment from the cockpit found fame as the wording on a tee-shirt that was already selling by the thousands by the time he reached the next race in Austin. Once again, though, he had kept himself to himself.